Curt Schilling said he will become a free agent after the season and won't let that distract him during his fourth year with the Boston Red Sox. General manager Theo Epstein wouldn't rule out in-season discussions for a new contract. At a brief meeting between the two Wednesday, Epstein told the pitching ace that the team would not give him an extension during spring training, as Schilling had wished. "Curt's going to be 41, and at that age we've got to be a little more conservative," Epstein said Thursday. "It doesn't mean we don't want him back. I have all the confidence in the world that if Curt wants to pitch in 2008 and he's still pitching effectively, as I expect he will, then we'll find a way to keep him in a Red Sox uniform." Epstein also said Schilling will be the opening day starter April 2 in Kansas City and "I couldn't be happier about that." Schilling said he didn't warn the Red Sox that it might cost them more to sign him after the season. Even if they want to keep him, he still could leave. "I'll consider anything at that point," he said. Schilling struggled late last season and went 15-7 with a 3.97 ERA. Bothered by injuries in 2005, he was 8-8 with a 5.69 ERA. But in 2004, his first season with Boston, he was 21-6 with a 3.26 ERA and a star of Boston's World Series sweep of St. Louis. Late last month, Schilling said he wanted to play in 2008 after stating previously that he would retire after the 2007 season. Schilling, who represents himself, also said he would play for the same amount he's making this year, $13 million, but he wouldn't negotiate after opening day. On Thursday, he said he was "disappointed" but understood the club's position. He also said he would not negotiate with the Red Sox during the 15 days following the World Series, when they are the only club allowed to discuss money with him. "I will file for free agency at the end of the season and they know that," Schilling said. "I'm going to get ready for opening day and this is not going to change anything that I do or how I do it"
Manager Terry Francona, who also managed Schilling in Philadelphia, indicated the pitcher could alter his stance. "He was also going to retire," Francona said. "You know what I'm saying. Things change." Schilling became the first Red Sox pitcher to pitch batting practice on Thursday, throwing about 40 pitches to minor leaguers Jeff Corsaletti, Jeff Natale and Andrew Pinckney. "It's a business, and I get that," Schilling said. "I woke up, the sun came up today and I'm getting after it." He also said he won't let the uncertainty about the 2008 season distract him or give him any more motivation. 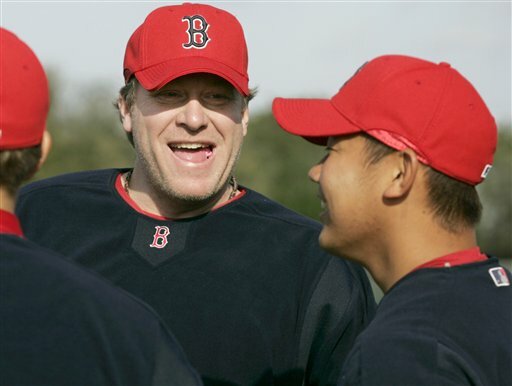 "The best three years of my career _ '97, 2001, 2004 _ were all first year of multiyear contracts," Schilling said. "I don't pitch for contracts." He signed a $37.5 million, three-year contract before the 2004 season after leaving Arizona as a free agent. A $13 million option for 2007 became guaranteed because the Red Sox won the 2004 World Series. "Regardless of whether he's signed for 10 years or one month, he will pitch like he's always pitched," Francona said, "give you everything he has." Schilling said his meeting with Epstein on Wednesday lasted about three minutes and followed other discussions in which contract details were discussed. "There was no offer," Schilling said. "He asked me if I wanted the long story or the short story and I said, `Give me the short one.' So it was quick." Schilling is the No. 1 starter in a strong rotation that includes three 26-year-old right-handers _ Josh Beckett, Daisuke Matsuzaka and Jonathan Papelbon. Tim Wakefield, 40, is the fifth starter. Boston also has promising lefty Jon Lester, 23, who appears close to full strength after offseason treatment for anaplastic large cell lymphoma.